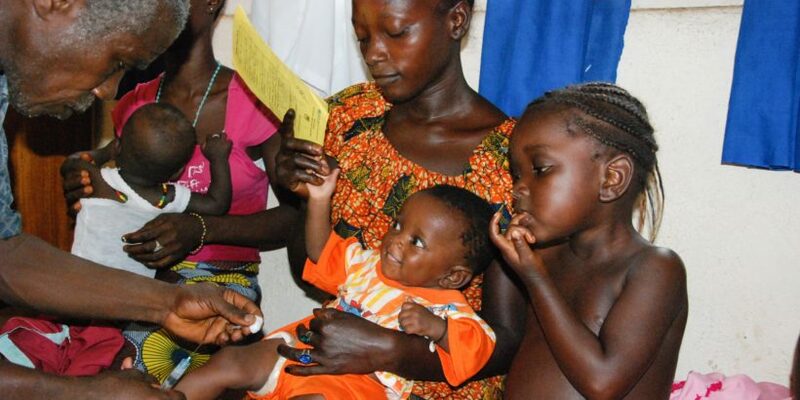 Advocacy is one of the most effective ways to achieve public health goals by ensuring that the necessary resources, political will, and policies are available to support, scale up, and sustain health programs. Advocacy plays a central role in generating support for typhoid conjugate vaccine (TCV) introduction; improved water, sanitation, and hygiene (WASH) programs; and the policies and budgets that are required to sustain access to these interventions. Advocacy promotes accountability and ensures that related political commitments are translated into actions that yield results and reach intended beneficiaries. There are a range of actions that advocates can take to elevate the importance of typhoid at the global, regional, national, subnational, and even community levels. The actions outlined below are not intended to be an exhaustive list. Rather, it is a menu of options that can be employed to advance the typhoid agenda. All of the actions below require adaption based on individual contexts, decision-makers, and you (the advocate)! Click the image on the right to download the PDF version of this page. Review current plans, strategies, and policies to identify the specific actions and commitments the ministry of health and other government leaders have already made to address typhoid in your context. Helpful hint: Plans and policies may include those related to child health, vaccines, and WASH. Conduct a policy analysis by reviewing national and subnational plans and policies to identify typhoid-related gaps that can be addressed through policy revisions and/or increased budget commitments. If it does not already exist, conduct landscaping at subnational levels to highlight barriers to access for typhoid prevention, diagnosis, and treatment, as well as highlight health care worker concerns. Helpful hint: Understanding the barriers will help guide the development of new policies, plans, and strategies that prioritize typhoid prevention and control. Carry out stakeholder mapping to identify key decision-makers and influencers who will be involved in conversations and decisions related to typhoid policy and TCV introduction. Identify specific individuals or audiences who play a crucial role implementing current typhoid-related plans (i.e., nongovernmental leaders). Determine the level of awareness and commitment that these individuals hold. Helpful hint: These individuals and audiences may include medical professional associations, health care workers, teachers, and religious leaders. If needed, educate these individuals to specific and relevant typhoid issues in your context. Identify the individuals or audiences that need to be engaged across government structures to secure buy-in and coordination for the development and implementation of typhoid prevention and control plans, strategies, and policies. Learn about your decision-makers’ understanding of typhoid in your country. Identify information gaps and connect with local researchers to determine existing evidence that can be shared to inform key leaders. Identify ongoing research and TCV introductions in neighboring countries so you are aware of new evidence that can inform decision-makers. Build alliances with local partners who are working across various sectors, including typhoid, vaccines, WASH, and child health, to develop a shared advocacy agenda with consistent messaging. Helpful hint: Consider partners who are working in the private, education, and agriculture sectors. Work with local researchers to engage a wide variety of decision-makers, health professionals, and program managers to ensure these local champions are informed and endorse TCVs and WASH programs. Draft a set of core messages that will be used across partners to send one comprehensive and consistent set of messages to key decision-makers. Work with local partners, including researchers, to translate and package emerging data and evidence on typhoid burden and TCVs into briefs and publications that can be shared with key stakeholders. 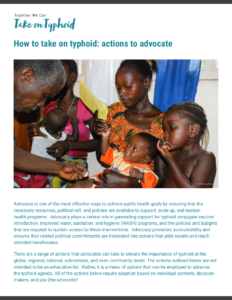 Create information packets that can be shared with key medical professional associations and health care workers to ensure they support typhoid prioritization. Conduct briefings to educate decision-makers on the need to invest resources to address budget shortfalls and ensure sustainability for WASH, child health, and vaccine programs. Helpful hint: Decision-makers may include parliamentarians, ministry of finance representatives, and subnational leaders. Attend relevant child health and vaccine technical working group meetings to provide information and highlight current policies and commitments to relevant stakeholders, including parliamentarians, ministry heads (finance, education, infrastructure), subnational leaders and health teams, health professionals, and community members. Helpful hint: Ensure that these individuals are aware of current policies and are attuned to potential revisions and changes that are needed to strengthen policies and commitments for typhoid. Meet one-on-one with decision-makers to share relevant data, evidence, and information on typhoid prevention and control to understand their perspective and discuss their interest in prioritizing typhoid. Host small dinner meetings for strategic leaders to advocate for increased domestic financing to support sustainable access to, and availability of, typhoid prevention and control. Helpful hint: Financing opportunities may exist among the private sector, bilateral and multilateral donors, and global initiatives, including the Global Financing Facility. Call on decision-makers to make public commitments to typhoid prioritization and introduction of TCVs in your country. Engage with the media to draw attention to and support for necessary policy changes at both national and subnational levels to prioritize comprehensive typhoid prevention and control tools, including TCVs and WASH interventions. Host community forums and meetings for decision-makers, advocates, researchers, and citizens to have a joint dialogue regarding the national and subnational tools needed for comprehensive typhoid prevention and control. Organize community social mobilization activities to increase public awareness on the importance and impact of typhoid prevention and control interventions. Helpful hint: Activities may include conducting town hall meetings, meeting with local or religious leaders, producing local radio spots, and attending local community meetings. Develop specific policy recommendations relevant for your country, which outline the actions needed to better prevent and control typhoid. Helpful hint: Recommendations may include introducing TCVs, updating WASH and child health policies, and increasing budget lines to sustain vaccine and WASH programs. Provide direct policy development support—or identify relevant individuals who can—to ensure policy updates include TCV introduction and improved WASH interventions. Conduct direct meetings with key decision-makers and influencers to ask for policy recommendations to be supported.